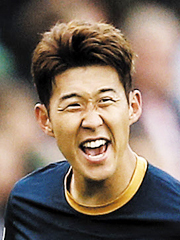 Son Heung-min's goal against Germany in the group stage of the 2016 Rio Olympics was voted the best goal of the year, according to the Korea Football Association on Monday. The KFA carried out a poll on its website and social network accounts for 10 days from Dec. 8 which drew over 27,000 fans. Son received 3,221 votes to win the honor. He was also named the top attacker of the year with 3,221 votes.